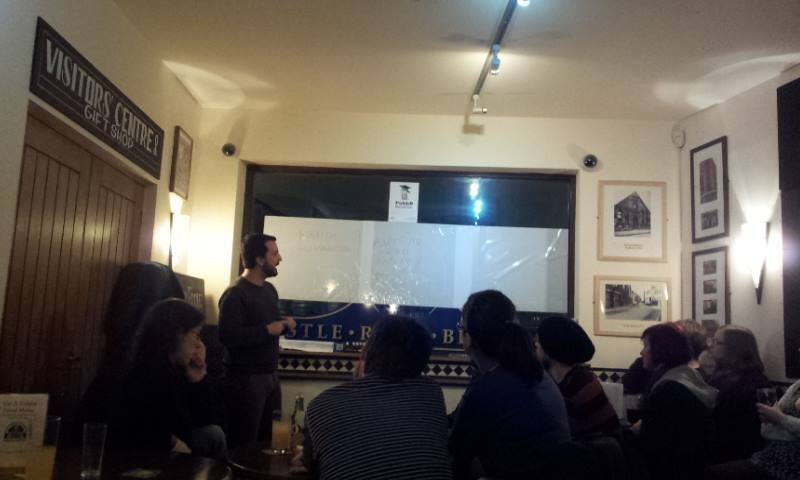 Considering the weather warnings, traffic problems and a pre football crowd making grabbing a pint fiendishly difficult – props and kudos to the hardy souls who made it to PubhD #2! Following the success of PubhD #1 we didn’t play around with the format too much, but we did try and move the tables around abit, and everyone seemed to be more comfortable and had enough places to put their drinks down. If anyone does have any other suggestions, please leave a comment below. So, first up was Ricardo Rato Rodrigues who is a second year PhD student at the University of Nottingham. He has not only cultivated a fine beard, but he has also been researching how literature can be used in the treatment of Post Traumatic Stress Disorder. As a non-medical professional, Ricardo was part of a group of arts researchers working with medical practitioners to help them understand how the use of books can help them empathise with the patients. Ricardo focused on the Portuguese writer António Lobo Antunes – a neurologist who was conscripted into the Portuguese Colonial War and wrote about his experiences. Ricardo Rodrigues – using literature to help PTSD patients. Ricardo struck a chord with an audience member, Jason, who introduced the group to the fine work they do at Books on Prescription. We also had our first challenge to a speaker when Ricardo was asked how he could be certain that the books did help if he wasn’t contacting the patients directly. Ricardo’s answer provided an insight into how controls and safety mechanisms play just as large a part in academia as the rest of life. The next speaker was Stephanie Smith who took time out from the third of her PhD to talk about her research into cell signalling in roots. Plant growth is caused by a single hormone (auxin) – how that travels from cell to cell controls what grows where and how big that thing grows. Stephanie is hoping to better understand this so that plants can be encouraged to use the soil better to retrieve nitrogen (long deep roots) and phosphorus (wide shallow roots) depending on their environment. Steph also waxed enthusiastically about Norman Bourlag, who until two months ago I had never heard of – he saved a billion lives but hardly anyone has heard of him. Steph Smith explains how roots can be encouraged to use soil better. Speaking to Steph after her talk she was most worried about there being an “anti GM nut” in the audience. She stated that being pro- or anti- any tool is wrong; after all, metalwork can create a gun but garden gates are useful too. 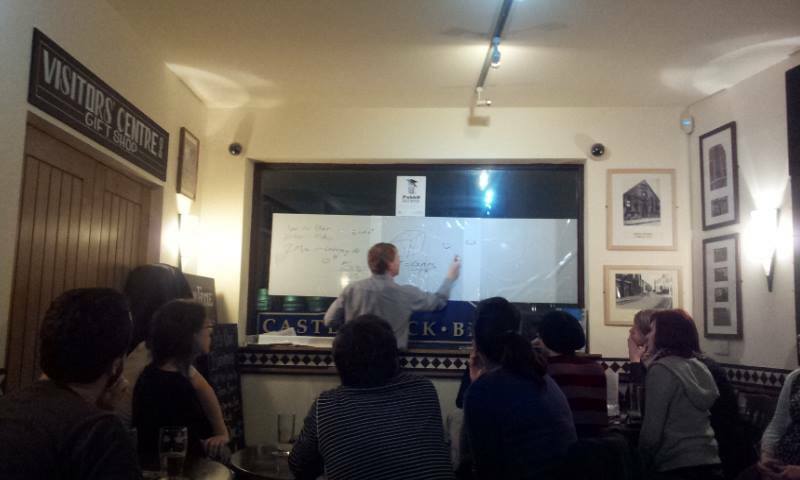 Thankfully, a PubhD crowd likes its anger evidence based! The final speaker of the night was Julian Onions. Julian works in the astrophysics department of Nottingham University using model simulations of Universe creation and hoping to better understand why, when we look up to the skies, it looks like it does. Simplifying the models so that gravity and dark matter are the only ingredients can produce pretty good models for the big stuff in the Universe, but, as Julian gracefully conceded in the Q&A, the small stuff like supernovae and black holes complicate things. Julian was also happy (almost cheerful) to admit that no one really knows what dark energy really is. However he did draw an interesting analogy with neutrinos – they were originally predicted in order to make the maths work with out but were not observed until quite some time later. A personal high point of the night was that Julian was the first person I’ve ever heard use the word “parsec”, and it not be in a Star Wars conversation. I must be growing up! So, with two meetings successfully under our belt, and with new faces each month, along with other groups now meeting as well, PubhD is definitely here to stay! We look forward to seeing you all next month – which has already been arranged! 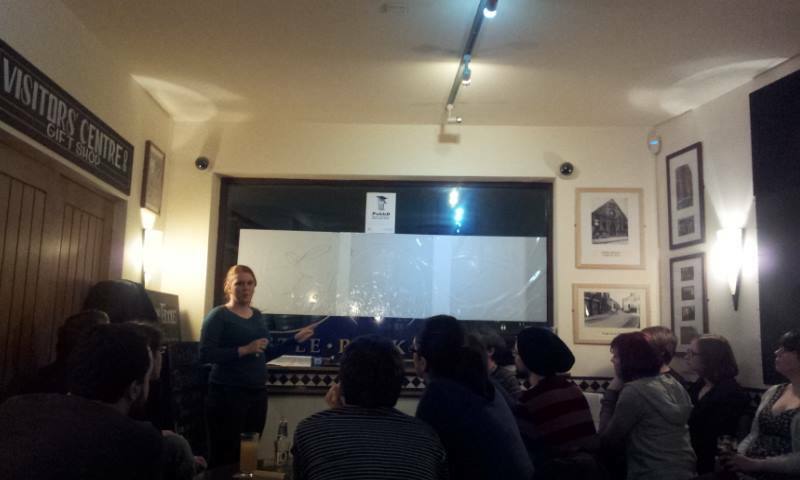 This entry was posted in Reviews and tagged Astrophysics, Literature, Plant Biology, PubhD by misterregars. Bookmark the permalink.